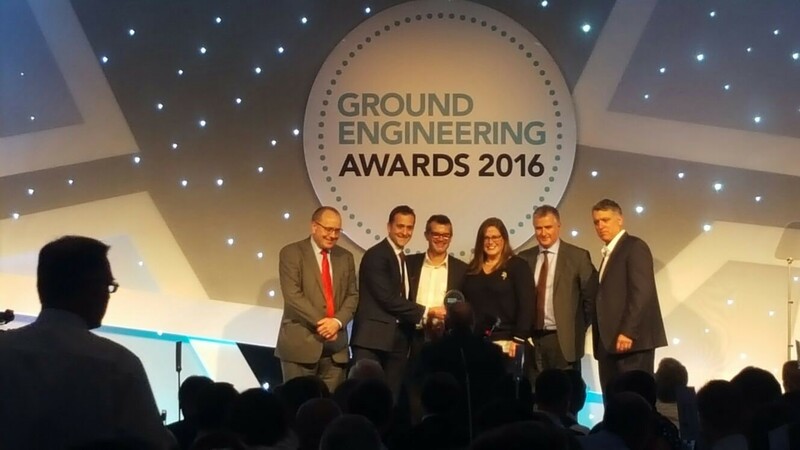 Attracting some of the biggest names in the industry, the 2016 Ground Engineering Awards recognise and celebrate the engineering excellence of the finest firms in the country. The award winning project was the Remediation of Ballynacor Sewage Sludge Lagoons using sewage sludge incinerator ash. VertaseFLI and Wardell Armstrong were commissioned by a joint venture consortium of Veolia Water / Laing O’Rouke, on behalf of Northern Ireland Water to assess the potential environmental impacts of 5 lagoons at Ballynacor Waste Water Treatment Works (WwTW). The five sewage lagoons were historically used as settling lagoons for sewage sludge at Ballynacor and from the surrounding area. Their use ceased a number of years ago and they were no longer required as part of the WwTW. Ground investigations and detailed quantitative risk assessments identified the lagoons as contaminated with hydrocarbons, amines and heavy metals at levels which represented a potential on-going source of contamination and an unacceptable risk to the environment, most notably the local water resources and Lough Neagh, a sensitive SSSI site. VertaseFLI and Wardell Armstrong then undertook a detailed review of the potential remediation solutions and produced a remediation strategy to mitigate the identified risks. The client’s original intention had been to empty the lagoons and remove the sludge to landfill, which was a hugely unsustainable and expensive option. However a remediation options appraisal identified Stabilisation and Solidification (S/S) of the lagoons as the most suitable approach and was the only option able to generate a fully treated material suitable for re-use on site. The sustainable credentials of the project were further enhanced through the innovative use of waste ash destined for landfill within the remediation process. This waste was Sewage Sludge Incinerator Ash (SIA) generated at a nearby facility which had no viable or economic outlet and was being taken to landfill. This use of this SIA resulted in a reduction in the volume of other reagents required to treat the sludge and also avoided the cost and environmental impacts associated with landfill disposal of the utilised waste material. Please contact Dr Chris Piddington for any further information or to discuss your remediation requirements on 01275 397 600.